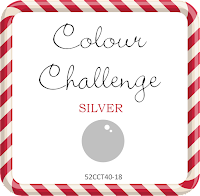 The Colour challenge at 52CCT is to make a card using silver. I decided to make a card by stamping in Versamark on Black cardstock, then using silver embossing powder to add to the design elements of the image. I made two cards: one simple, and the other with a detailed silver frame. I used a Stampedous stamp called Our Doorstep.